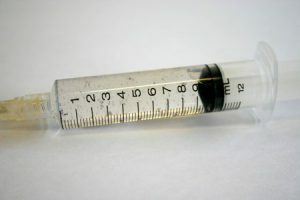 A spore syringe contains sterile water with hydrated spores in it. This spore water can be inoculated in the substrate of your choice. This way the chance that the spores will germinate is much higher. The reason that you have to hydrate the spores in water first is that they most likely will be too dry to germinate otherwise. To make a spore syringe you have to work under very sterile conditions, so take all necessary precautions. 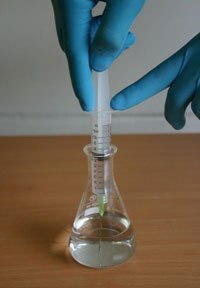 Try to work quickly, efficiently and with a steady hand when making a spore syringe. You can make several syringes from 1 print. 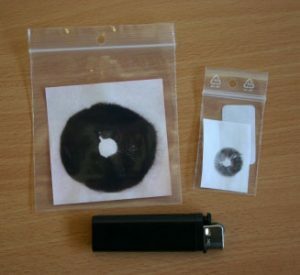 It completely depends on the size and darkness of the spore print how much syringes you can make from it. From some prints, only a few syringes can be made, while from other prints there can be made even 30 syringes from. 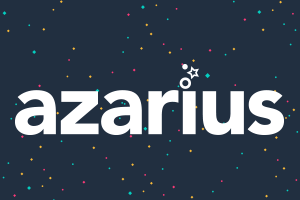 The first thing to do is sterilize the water in a small bottle covered with tinfoil. The best way to go about this is to do it in a small flask. 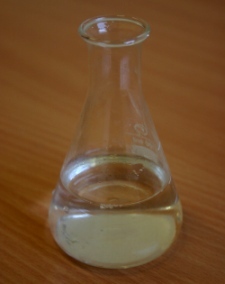 The narrow neck of the flask reduces the chance of contamination drastically. Place the bottle in the pressure cooker. When your pressure cooker has reached 15 psi, you can lower the gas. Let it all stay for about 30 minutes at 15 psi. After these 30 minutes, you can turn the heat down and let it all cool off completely. This is very important. Don’t be impatient, when the water is too hot the spores will not survive. Cooling off will take at least several hours. When the water has completely cooled off, you can do the next step. 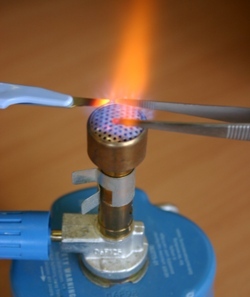 Sterilize the scalpel and your pair of tweezers by heating them with the gas-burner. Keep them in the fire till they start to glow red. Take them out of the fire and have them 20 or 30 seconds to let them completely cool off. 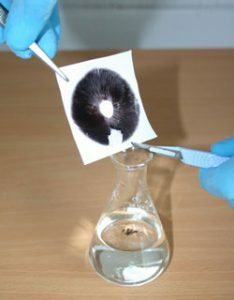 Remove the tinfoil from the flask with water and use the tweezers to take the spore print (partially) out of the bag. Scrape with the scalpel some spores from the print so they fall into the water. The spore syringes can be made immediately. 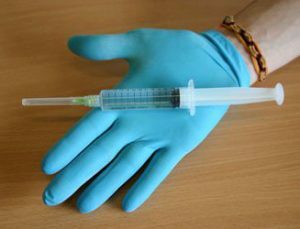 When doing the first syringe it’s a good idea to fill it once or twice and then empty it again into the jar. The spores are then well divided over the water. 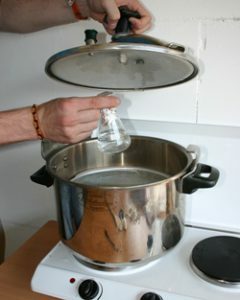 When making larger amounts of spore syringes, it’s wise to repeat this every few syringes. When the syringe is filled, it can not be used immediately. The spores need time to hydrate in the water. This will take at least 24 hours, but 2-3 days is even better (just room temperature or incubator). You can also save them for a later moment. 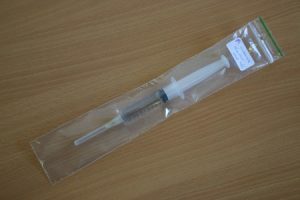 Spore syringes can be kept in the fridge at 2-4 °C for about 2-6 months. Save them in an airtight zip baggie.